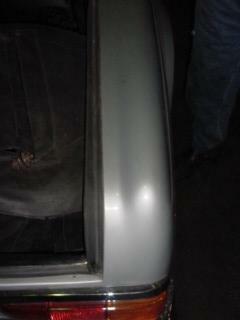 Newsletter No.062, CLK GTR for sale, Restoration projects..
Hello again. This Newsletter we have good news for prospective CLK Cabriolet buyers, news of a rare CLK GTR that is for sale and a few excellent restoration projects for sale. For those that are yet to sign up on the website, if you no longer wish to be notified of this newsletter please E-mail us here. Is your boot rubber correctly installed? 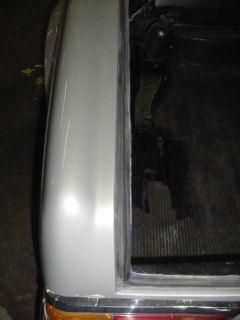 We see lots of boot seals that have been incorrectly fitted. The picture on the right is the correct way. When installed like this the pressure that the boot puts on the top of the seal when closed, makes it fold over and seal off the boot. It also makes a channel for the water to run in. When installed incorrectly (left hand picture) the pressure of the closed boot folds the seal over the wrong way! In the middle of a storm with the soft top down, occupants of the new Mercedes-Benz CLK Class Cabriolet are just as well protected against lightning as passengers in cars with a rigid roof. This was one of the findings of an extensive series of tests commissioned by Mercedes-Benz and performed by the Institute for High Voltage and Power Engineering at Berlin's Technical University. The state of the art steel and aluminium design of the CLK soft top featuring main mounts that are each fastened to the car body at three points shields the car interior from the powerful electrical fields generated by lightning strikes. In the event of such a strike, the longitudinal struts and cross members that make up the soft-top frame assembly act like a Faraday Cage, thus allowing the electrical current to flow towards the outside of the frame and ensuring that the car interior remains a "field-free zone". This principle was discovered by the British physicist Michael Faraday (1791-1867) at the beginning of the 19th century and still forms the basis for all sophisticated lightning protection systems to this day. During the series of laboratory tests carried out at Berlin's Institute for High Voltage and Power Engineering, scientists discharged several dozen lightning impulses across the CLK Cabriolet using powerful capacitors connected in series. Lightning impulses of up to 1.4 million volts were achieved during the course of these tests. Measure-ment of the electrical field strength inside the closed CLK Cabriolet confirmed the protective effect of the soft-top structure acting as a Faraday Cage: the lightning current was guided harmlessly to ground via the soft-top frame assembly, the car body and the tyres. Thanks to reliable shielding, the electronic systems on board the CLK Cabriolet also proved immune to the powerful electromagnetic field generated by the lightning current in each of the tests. In the past year, there were some 2.9 million cases of lightning discharge during storms over Germany, Austria and Switzerland, compared to around 2.2 million cases in 2001. The highest lightning incidences were recorded in the months of June, July and August. With over 190,000 incidences, June 20 was Germany's most prolific day for lightning in the year 2002. Lightning is discharged around one million times per hour above the Earth's surface. The previous owner had driven it for 24 years and loved it to death, however the time had come for a car with power steering and air conditioning. 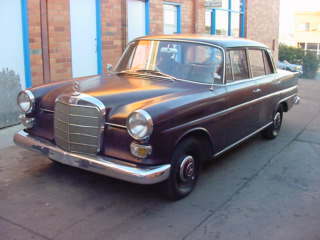 Whilst first looks will disappoint, this car is a real gem if you are looking for something like this to restore. The big plus is that it has NO rust and the chrome is great. In fact it has one of the best bodies I have seen on a Finnie for years. The cars major fault is that it has a burnt out exhaust valve on one cylinder and the engine does not run well. If you have not SUBSCRIBED to the website, this is the last Newsletter that you will be getting. The time has finally come to ditch the old system, there are however a few subscribers left on it. So if you have not SUBSCRIBED please do so as we would hate to lose you. This weeks link of the week was sent in by one of our Newsletter Subscribers. Click here to visit Carcity in Hong Kong. If you have the spare cash lying around you can buy a CLK GTR from them. 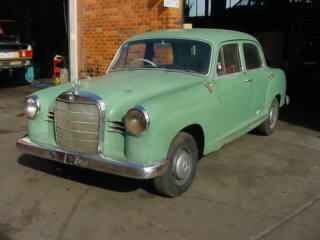 Other vehicles of note that they currently have for sale, include a rare 600 Pullman and a 190SL. You can also check out the traffic in Hong Kong from this site. AG, Seelze near Hannover, Germany. If you have seen any great sites on the web, we need to know about them. Please e-mail them to me.